Only the other day, a brightly coloured package arrived at Miss Lemon's door. Imagine her delight when after untying the ribbon she discovered a book bedecked in a shade Miss Lemon could only describe as eponymous. 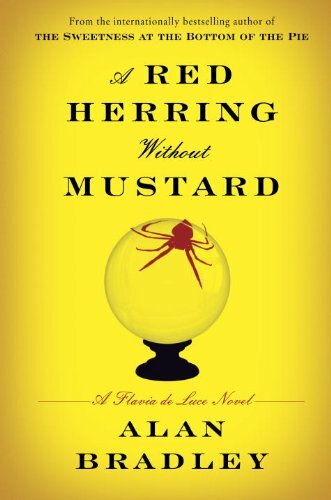 It was the latest in the Flavia de Luce series: A Red Herring Without Mustard. 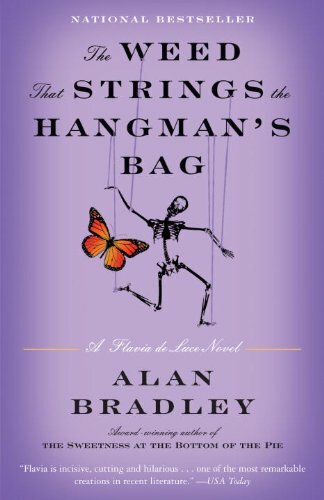 The package reminded Miss Lemon that there was another book by Alan Bradley with a similarly eccentric title that sat among her prodigious bookshelves, patiently awaiting her attention. Dismayed at having neglected the followup to such a delightful debut as The Sweetness at the Bottom of the Pie, Miss Lemon set to The Weed that Strings the Hangman's Bag with alacrity. She wasn't disappointed. After making a brief adjustment to her suspension of disbelief to the incredible precociousness and cultural wisdom of the novel's eleven-year-old detective, Flavia de Luce, she found many of the same narrative pleasures and surprises as she found in Mr. Bradley's first novel. Only this time it is July, not June, and the murder victim is a puppeteer rather than a philatelist. Once again, Flavia attempts to poison her older sister, Feely. Once again, she carries out harrowing experiments in her laboratory to find out things that perhaps she'd be better off not knowing. Once again, she cloaks her tale in a colourful cape of amusing metaphors and wry philosophical observations. In short, this is a novel not to be missed. And as it refers to several of the events in The Sweetness at the Bottom of the Pie, it may be prudent to read it before cracking A Red Herring Without Mustard. And when they meet, they one another mar. Indeed, my dear readers, mark this well. For in it, you'll find many a clue; perhaps even before Flavia de Luce does.